Tokyo is generally known for its skyscrapers, its hyperactive city life, its shopping malls, its crowded subway and modern technologies. There is, however, a spiritual side to Japan’s capital as well. 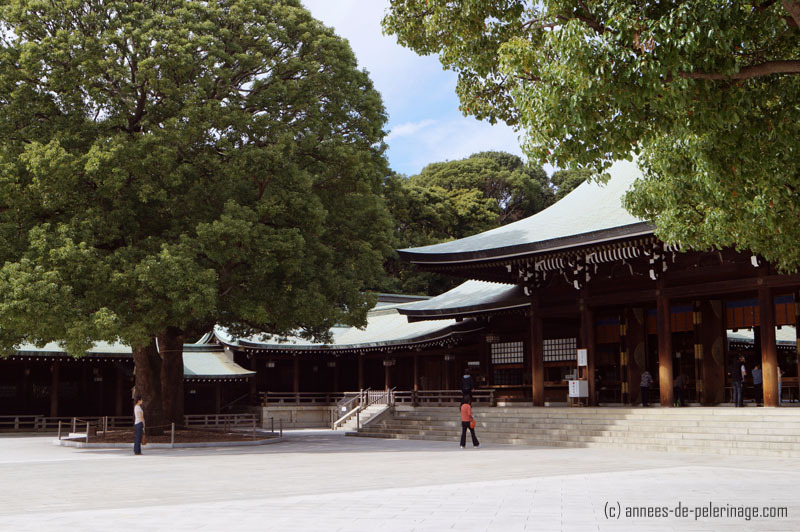 Located rather close to the center of the city, near the world famous Harajuku Station, you will find the Meiji Shrine – or meiji jingu (明治神宮) how it’s called in Japanese. 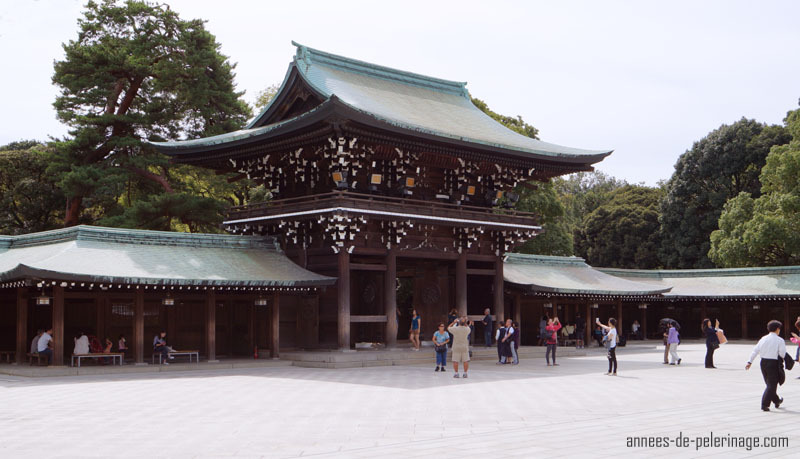 The shrine is dedicated to the deified spirits of Emperor Meiji and his royal consort. It consists of a huge landscape park, a spacious temple, and a museum. Among tourists, it’s one of the most popular sightseeing spots. If you want to know about the other landmarks, like the imperial palace, you absolutely should read my list of the 20 most amazing things to do in Tokyo. Meiji shrine was built in 1920 to commemorate the Emperor of the Meiji Era (1868 – 1912) and his wife, Empress Shoken, and is located right at the end of the famous Omotesando Avenue and next to Yoyogi park. The Shinto shrine (to avoid confusion and embarrassment: it’s not a Buddhist temple!) presents itself with a somewhat modern design – even more so since the whole complex burned down during World War II and was only reconstructed by 1958. I found the modern take on ancient Japanese temple architecture quite pleasing. If you start at the main entrance and walk along the extremely spacious pathways you really can’t miss anything. Most of the park consists of 100.000 trees that have been donated from people all over Japan back when the shrine was built. Along the way to the main complex, you will see a gigantic torii. Torii are lofty gateways that mark the entrance a to a sanctified ground or spiritual sites. The torii at Meiji Shrine in Tokyo is said to be the biggest in Japan with a height of over 12 meters (which is why it’s called o-torri). Right next to the biggest torii you will find the entrance to the Treasure house (homotsuden). I personally didn’t find the exhibition very spectacular and would recommend you to skip that part of the shrine. You will be able to see some personal items from the late Meiji Emperors belongings and other artwork from the Taisho and Showa era. If you are really interested in that part of Japanese culture & Meiji resoration in general, you might want to check their official website – sometimes they have decent special exhibitions. Onwards from the big torii the gravel path will lead on to the actual temple. Expect the walk to be quite long. The roughly 15 minutes you will need, will offer a welcome respite from Tokyo’s hustle and bustle, though. 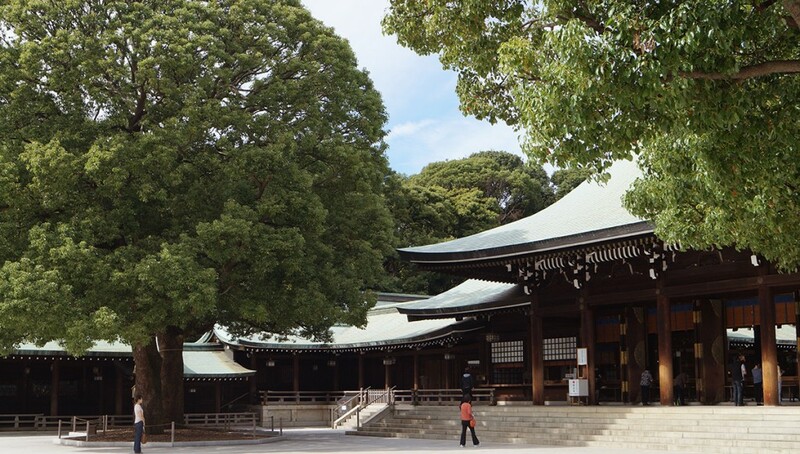 Once there, make your way through the big courtyard and enter the main hall of the Meiji Shrine. There you can observe Japanese people during their prayers. If you are lucky, you might actually be able to see a traditional Japanese wedding procession or some Shinto priests. You will definitely see big stalls with thousands of wooden tablets (called ema). 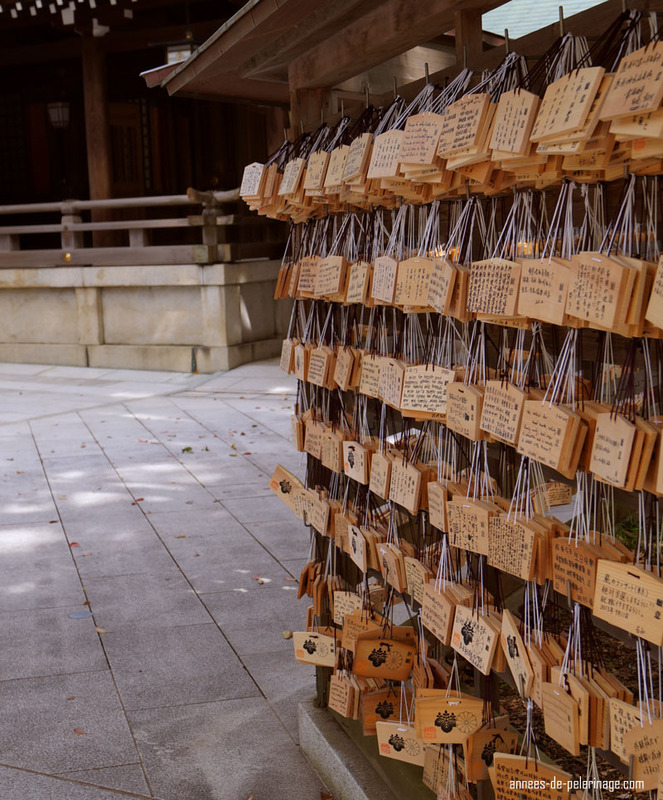 Here believers will write down their wishes and prayers so the priests can offer them to the gods. Finish your visit at Meiji Shrine with the Inner Garden (gyoen) south of the main complex. The garden was a gift from the Meiji Emperor to his wife, Empress Shoken, and will win you over with its flower arrangements and silent tranquility. 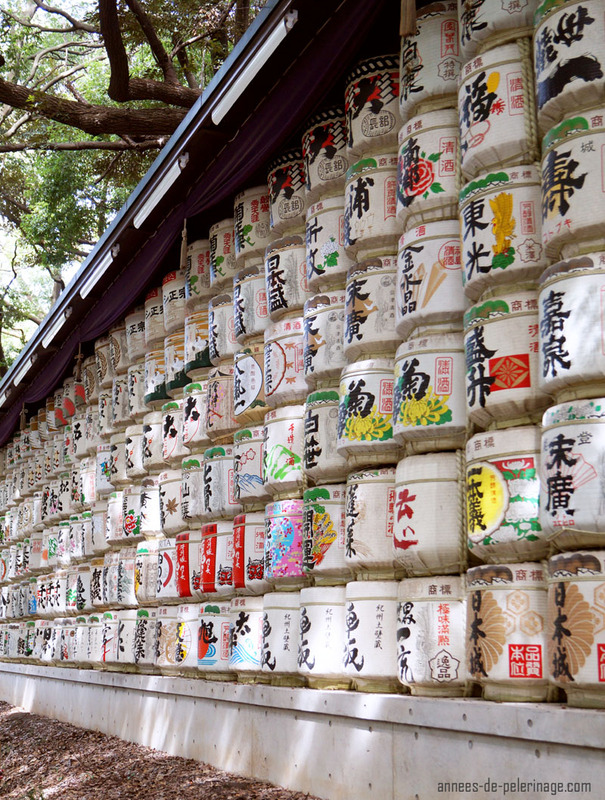 Last note: You might be wondering what the huge walls filled with colorful barrels along the way to Meiji Jingu are, right? Those are mostly sake casks and official offerings dating back from the shrines consecration. The Meiji shrine will be beautiful throughout the year. However, there are four auspicious dates you might want to mark down in your calendar. On New Year’s Day, half of Tokyo will be there to offer their first payer of the year (called hatsumode). More than 3 million prayers have been counted on that day at Meiji Shrine – so prepare for a crowd (source)!!!! You could also go on the second Monday in January, called seiji-no-hi (which roughly translates to ‘Coming of Age day’): Thousands of Japanese youths aged 20 (the age of majority in Japan) will come to the temple to celebrate their adulthood. For tourists this will be a particular impressive sight, since everyone will be wearing traditional costumes (kimono). Now since few tourists will chose winter for their trip to Japan, I can also recommend June to visit Meiji Shrine. Down in the Inner Garden the Irises will be in full bloom during that time and offer a spectacular sight very popular among local photographers. The last auspicious date in the ritual year of the Meiji Shrine would be November 15th (or the weekend following the 15th, since it is not a national holiday). This day is known as Shichi-Go-San (Seven-Five-Three) and is another rite of passage. Girls aged seven or three and boys aged three or five will celebrate their passing into middle childhood. 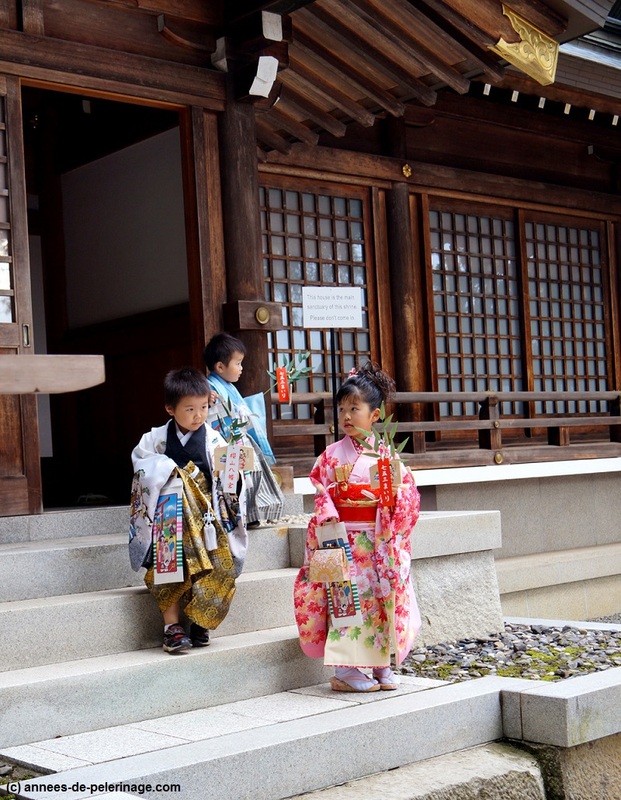 Children typically will wear traditional clothing and that will offer a particular endearing sight. Other than that there is a high chance you will see a traditional Japanese wedding on your visit at Meiji Shrine no matter when you go. To me, it felt like it was hard not to see one! 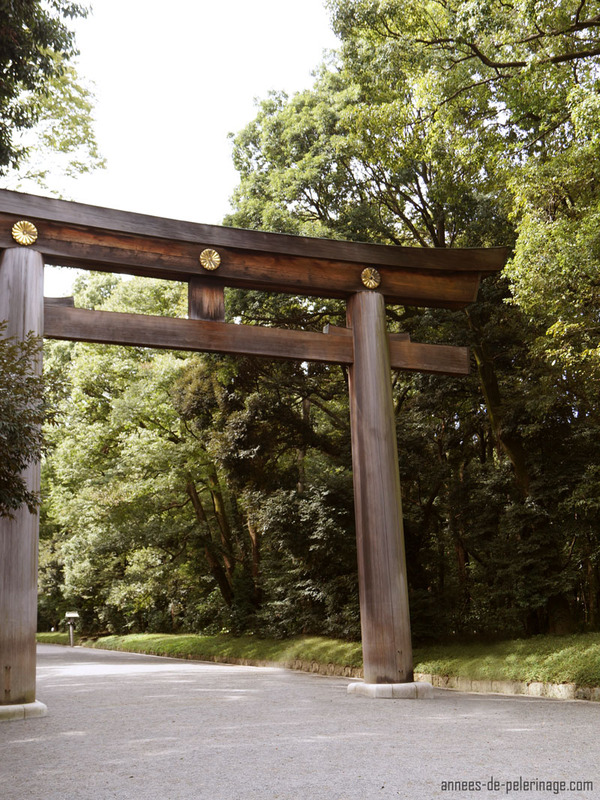 Meiji Shrine will be open all day long and no tickets are needed to get on the ground. Or rather the shrine opens at sunrise and closes at sunset. Accordingly opening times change throughout the year. This probably won’t be a problem for you except you are visiting in winter, when the sun sets quite early (check the opening hours on the official website to make sure). If you want to go to the museum other opening hours apply. The Treasure Museum (homotsuden) will be opened from roughly 9 am to 4 pm.Tickets (actually it’s a contribution for maintenance) go for 500 Yen and can be purchased directly at the entrance to the museum. Basically the same applies to the Inner Garden (gyoen). The admission fee for the garden is 500 Yen as well and opening hours are 9 am to 4 pm (except in summer, when the gardens will be opened till 4:30 pm). The easiest access would be via Harajuku Station on the Yamanote Line (that’s the circular line). 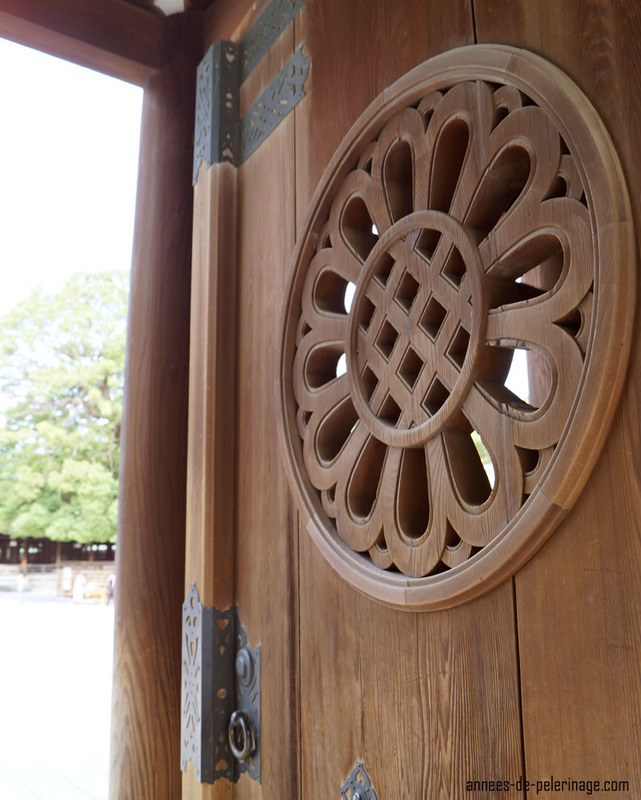 The main entrance to the grounds of the Meiji Shrine will be just around the corner. You can actually see the trees from the tracks. Meijj-Jingu-Mae would be your other options, if the Chiyoda or the Fukutoshin Line are easier for you. Is it worth going to Meiji Shrine? Seeing those thousands of huge cedars right in the middle of Tokyo is quite an impressive experience in itself. The sheer immensity of the park and its gigantic torii will overwhelm you, especially after a visit to downtown. Meiji Shrine itself cannot compare to anything you will see in Kyoto or Nara though – neither in terms of splendor nor in terms of antiquity (e.g. check my review of Kasuga-Taisha here). So my advice would be – if Tokyo is your only stop in Japan – definitely go there. Otherwise, you might want to skip it. There are literally 1000 temples in Nara and Kyoto and you will get the ‘temple sickness’ (how I coined it) if you plan to see too much of them. Naturally, if you are going shopping in Harajuku anyway, you might as well drop by at Meiji Shrine, since it is so close. Plan roughly 1 hour for the shrine itself, more if you want to see the Inner Garden or the Treasure Museum. 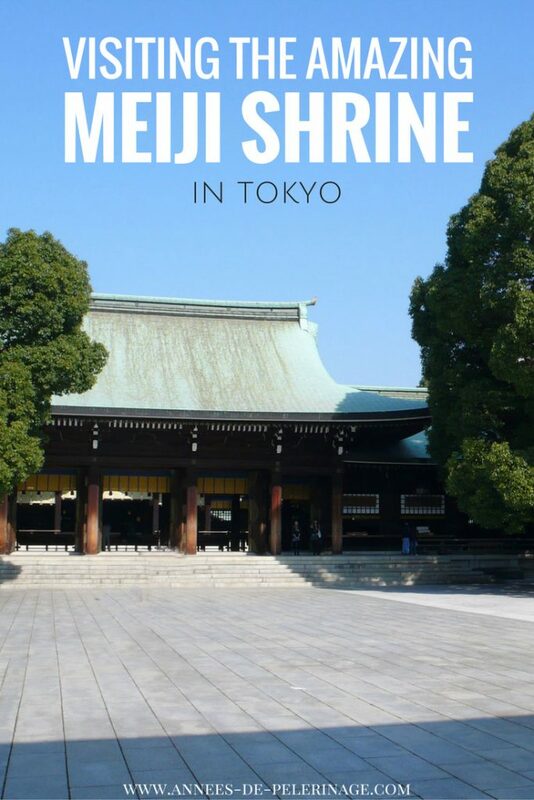 Do you like my little travel guide to Meiji Shrine in Tokyo? Share your thoughts in the comment section below! If you like Japanese Shinto Shrines make sure to check out the Itsukushima Shrine in Miyajima – where Japan goes beyond beautiful!